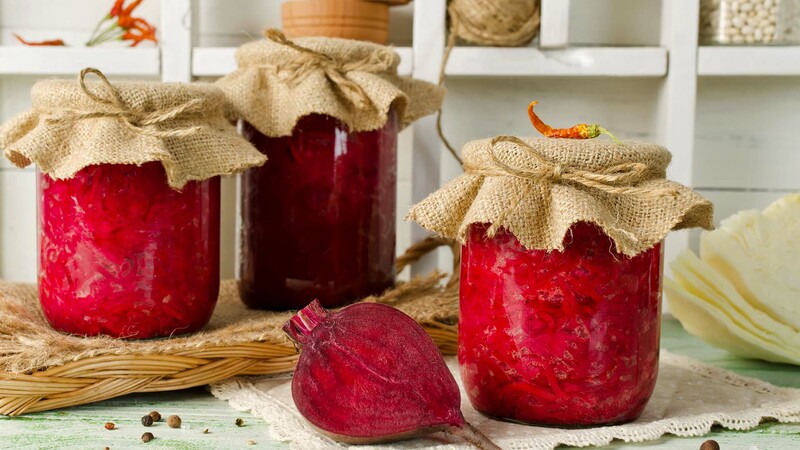 Fermenting is not only on trend, it’s also an easy way to create nutritious and tasty foods. In biological terms, fermentation describes anaerobic metabolism, the production of energy from nutrients without oxygen. This scientific-sounding process is actually a straightforward way of creating food which has a unique flavour and packs a nutritional punch. And the benefits don’t stop there. Fermenting food cuts down on food waste, makes food easier to digest, decreases cooking times, and introduces ‘good’ bacteria to your body. Fermented foods are big news at the moment, but the idea definitely isn’t modern. Fermented foods are found in cultures world-wide – kimchi in Korea, kefir in the Caucasus Mountains, miso in Japan, and sauerkraut in Germany. Traditionally, fermentation was largely about preservation, as people looked to keep food edible without the assistance of modern tools, like refrigeration and packaging. But these foods don’t just ‘keep’, the fermentation process actually gives them a nutritional edge. Sourdough and kombucha are now Australian café staples, but cheese, yoghurt, sour cream, soy sauce, vinegar and coffee are all products of fermentation. When so-called superfoods come into vogue they generally also become expensive. Fortunately, creating fermented foods doesn’t cost a lot of money, and for the most part, it’s also really easy. Here are two you can try at home. Despite the name, there’s no dairy involved here. Lacto-fermented vegetables use naturally produced lactic acid to do the pickling. Fruit and vegetables all have naturally occurring ‘good’ bacteria on their surface. When they’re put into an oxygen-free environment, these bacteria work to turn the natural sugars found in vegetables into lactic acid, which acts as a preservative and, best of all, creates a delicious tangy flavour. To get going, grab a jar (a mason jar is perfect) and choose your favourite vegetables. From a purely aesthetic point of view, it’s nice to have a few different colours in there. Common options are carrot, cauliflower, capsicum, cucumber and jalapeño peppers, if you like spice. Chop and layer these in your jar. Add spices to taste – good options are oregano, mustard seeds, bay leaves, and peppercorns. If you have a few dried grape leaves, or other tannin-heavy leaves, on hand, add them and they’ll help to keep your pickles crunchy. Pour salted water, brine, over your veggie stash, making sure that all your vegetables are completely covered before you screw the lid on. Making sure that vegetables are below the water level prevents mold – if you do notice a little skin on the top, you can just skim it off. Your pickles are ready when they taste good to you. Experiment and find out what you like. They could be ‘ready’ in a few hours, or a few weeks. They can pickle in a cupboard, or, since you’ve got a colourful jar on the go, just leave it out on the bench. The end product is a tangy and crisp take on pickling, perfect to add to any meal, to pop into a sandwich, or to build a platter or a Ploughman’s Lunch around. Another great lacto-fermented food you can make is Sauerkraut. It’s simple, cheap, and delicious and you can prepare it in small batches. This is a great versatile food – you can eat a teaspoon or two as a snack, use it in sandwiches or salads, or enjoy it as a side, perhaps with a traditional German schnitzel. To make sauerkraut in a small batch, use a mason jar. You can use red or green cabbage. Shred it by hand, or in a food processor. Pack it into the jar, filling to the three-quarter mark and add caraway seeds. Cover the cabbage with brine. To make sure that the cabbage stays under the water line, it’s a good idea to use one of the outer leaves to cover the top and make sure it’s tamped down. Screw on the lid, and let the fermentation begin. During the fermenting process, the cabbage releases liquid. A very active fermentation can push the sauerkraut up, so keep an eye on it and make sure it’s still under the water line. Over a period of days or weeks, the cabbage continues to break down, turning into sauerkraut. Like most fermented foods, you can let it pickle to taste. It can be left for three days, or three weeks. It’s a matter of figuring out what you like.